Jacklyn! She chose this gorgeous invitation from Smock. We are planning an elegant vintage/modern wedding reception at a historic Chicago church with a reception at an old golf course in Lemont. The colors will be black and white - likely a damask motif on our stationary - with a pop of green. The decor in the room will be lots of candle light and tall displays of white cala lilies - their exposed stems will serve as that simple pop of green in the room. I've always loved the look of letterpress. It is such a classic look and it truly can help us set the tone for a vintage wedding. Plus it looks so pretty and feels so nice when you run your fingers over it :) I always try to print all of my event invitations on letterpress at work and I always wanted to use letterpress on my wedding invitations one day but felt it was out of my reach so it would be amazing if I could win it through a contest! I love that Smock has so many different designs and that they are eco friendly as well. Initially I was drawn to the first invitation featured on their page on your site. 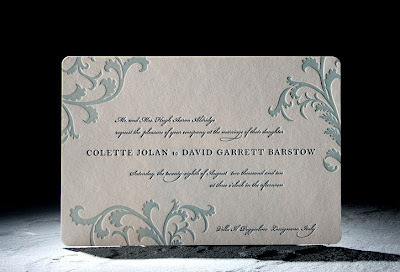 I love the classic script and I feel the design would work well with our damask theme. Thank you so much Kara at Magnificent Milestones for hosting this fantastic contest. What a wonderful way to kick off 2010! !